This is the first part of Export Worldwide’s guide on the different methods of export marketing. Here Daniel and Mark cover traditional routes to market – or the ‘old school’ methods – and in the second part they cover digital routes. First off, it is useful to note that having English as your first language is both a blessing and a curse because a German and an Italian are happy to communicate in English as they are both making the effort to learn the international language of trade, English. The down side of having English as your first language is there is no other language that we can learn that is as widely used in international trade, so we have to make the effort to communicate in multiple languages. However, the up side is that everybody who wants to trade internationally will speak English, to a greater or lesser extent, so after the initial communication, English will be the language of trade. 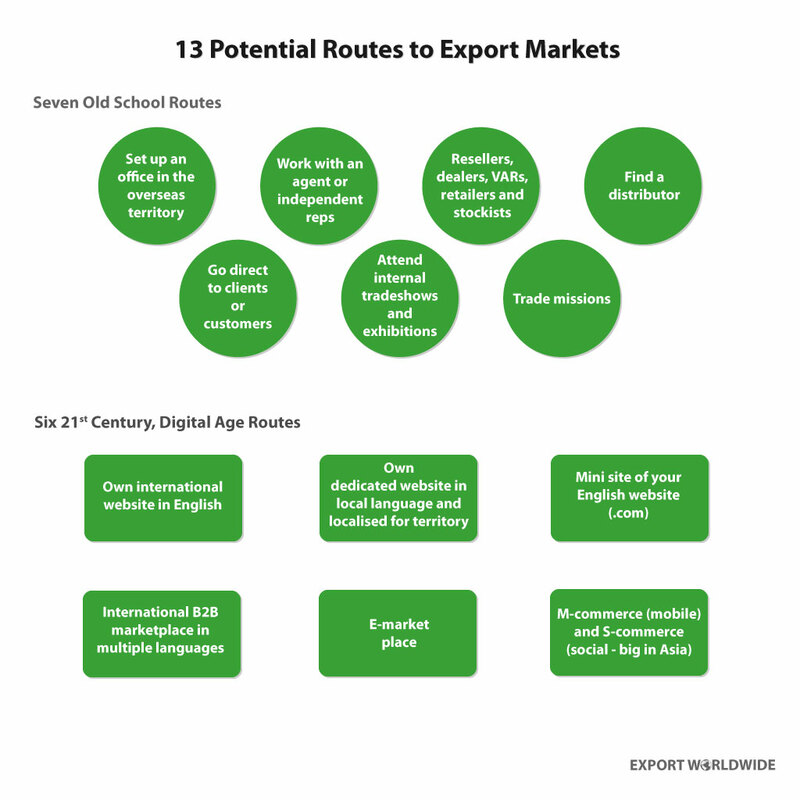 In this two part feature I will discuss 13 routes to market that I have split into ‘Old School’ and more current 21st Century routes to export markets that weren’t open to SMEs prior to the digital age. This is not to say that new is better than old school because all routes to an export market are valid, provided you make a profit utilising which ever routes to market you choose. The routes we will discuss are illustrated in the graphic below. The comments in this article are based on our own experiences of growing our own export sales from 6 per cent of sales to 67 per cent of sales, which led to one of our companies being named as National Exporter of the Year. It’s this success that inspired us to develop Export Worldwide. So, there are comments from the trenches, from people who have actually created and grown B2B export sales. This is a high-cost, high-risk venture as you will be trying to manage a remote office, possibly several thousand miles away, and also in a different time zone. The best way of implementing this route is to find somebody within your current organisation’s home market. They will know your products and methods of selling, however, this person then needs to learn the different cultural nuances of the target market. 1) It is not always possible to pull a trusted member of staff out of a role in a SME. 2) Lots of people don’t want to relocate to a new country. However, the benefits of having localised staff is that you have an excellent presence and appear as a committed local company. This is how we have approached exporting to North America, but one particular problem we have found is that culturally, American sales staff are very different to European sales staff, with a much higher turnover of personnel. Establishing a base in an international territory tends to be a long-term goal for SMEs. Once you have built up your experience of exporting indirectly, setting up a permanent presence could become a viable option for you. An overseas sales agent would be ‘the face’ of your SME in international markets. They introduce you and your products to customers and then invoice directly. Agents and independent reps are usually paid on a commission-only basis for introducing you to potential customers. Commission fees tend to range between 2.5 per cent and 20 per cent depending on your industry sector. Stockists will sell your products across their stores – both bricks and mortar and online. A distributor will buy your products from you and then sell them to customers via multiple third-parties. Distributors make money by purchasing your product and selling it on at a higher price. You can go direct to businesses or the consumer by getting on a plane and visiting potential customers face-to-face. Visiting overseas exhibitions is potentially one of the quickest and relatively cost-effective ways to research new markets, local competitors, customers and test the waters for demand. They’re particularly useful for products that ‘need to be seen to be sold’ or for services that need face-to-face explanations. 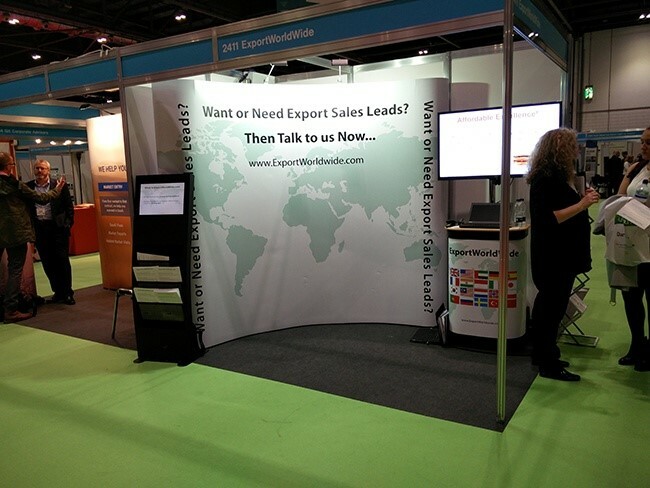 However, on a per lead basis, exhibiting overseas is generally expensive (based on our own experiences, exhibition leads can be 8 times the cost of a lead generated through digital marketing) and they generally only happen once a year so it’s a feast or famine of new prospects for your sales team and products. Trade missions, often supported by funding from the government, are overseas programs for companies looking to explore and pursue export opportunities by meeting with potential clients in their industry sector. They generally involve meetings with foreign industry executives, networking events and site visits to facilities that may require your products and services. These can be cost effective ways to research a potential export market, provided the trade mission is for an industry and territory that you plan to sell to. Read the second part of this feature on digital routes to market. Written by Mark Neal and Daniel Waldron for Export Worldwide.